No matter what part of the country you’re looking to live in, rental laws can often be confusing. For landlords especially, it’s crucial to understand how the landlord-tenant laws operate in your area, in order to protect yourself from any unwanted conflicts. One place which has an array of quirky rental laws is the city of Seattle. With the most recent census data from Seattle finding that nearly 52 percent of housing units are occupied by renters, landlords would be prudent to brush up on their knowledge of local ordinance and steer clear of any complications. One crucial component of the landlord-tenant relationship is the type of information that’s required to be disclosed by the property owner. These include, but are not limited to, any fees that may be refundable to the tenant, identifying any individual who may act on behalf of the landlord in his/her absence, or information regarding how to deal with issues surrounding mold in the property. You can find a full list of disclosure requirements here, to ensure you’ve got all bases covered. Seattle rental laws do not necessarily place any limit on the security deposit amount a landlord can ask for, but they do have statutes of limitation on when the amount must be returned. As such, landlords must return the tenant’s security deposit within 21 days of the move-out date, otherwise the former tenant is authorized to take up the matter in small claims court. Furthermore, certain disclosures that are required for the deposit need to be clearly written out to be valid in the lease agreement, and have specific reasons for which the security deposit may not be returned in full, or at all, depending on the condition of the property upon the tenant’s moving. This one is among the newer guidelines that Seattle landlords must follow, stating that those who express valid interest in the property first, also get the first option to rent out the home. In doing so, the “first-come” component is determined based on the date and time the applications were submitted, prioritizing the earliest applications first. Local Seattle rental property management companies can be useful in this case, helping landlords keep track of incoming applications from prospective tenants. The majority of states have laws and guidelines which require a landlord to take certain actions before they are allowed to enter an occupied unit. For the city of Seattle and the broader state of Washington, this includes a two-day notice from the landlord to the tenant regarding intent of entering. However, this law is bypassed by a one-day notice to the tenant in the event that the landlord is showing the property to a new prospective renter. The above laws, while only a quick overview of some of Seattle’s quirky renter guidelines are an introduction into many things that landlords need to keep tabs on. Whether trying to find the most qualified renter or trying to safeguard your property against unwanted future conflict, it’s crucial for landlords to have a grasp on what is expected of them when renting their properties. This way, the property owner remains within the legal boundaries to protect themselves, and tenants have a clear understanding of the guidelines they must abide by. Has anyone read the classic Bernstein Bears book (or seen the associated cartoon) about the Green Eyed Gimmies? It’s really a lesson for children about how they should be happy with what they have and not always be looking for something new/keeping up with the Jones’, etc. But it’s hard not to make those social comparisons, you know? It’s a natural human thing to look at our neighbors and feel a little pang of jealousy when they have the shiny new car or insert-whatever-the-new-thing-is. Recently I experienced a little bit of my own Green-Eyed monster, but not about something you might think. Does anyone else read Stephanie’s blog – SixFiguresUnder?? I have to admit I’m more of a casual reader, but I think someone recommended it back when I first started blogging here and, every couple of months, I’d head over to her blog to read their latest debt update. It’s been a minute (so I’m a little behind on this), but I recently went to check out their latest happenings and was shocked to see that they’re now DEBT FREE!!! (read Stephanie’s debt free post here). Now, I don’t know Stephanie. Never met her in my life. I have no connection to her or her family. But, as a reader, I was happy for them! 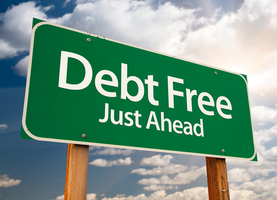 Becoming debt-free surely must be an incredible feeling! But I was surprised by an underlying feeling….that of envy. Stephanie and her family managed to pay off $144,000 in debt. My starting debt was $145,000. Stephanie started blogging in September 2013. I started blogging just a few months later, in February 2014. Our incomes started out about the same – Stephanie’s first reported monthly income was under $4,000 (from here). Our first monthly income was just over $5,000 (from here). Our incomes even increased around the same time. Her husband, a lawyer, opened his own practice which dramatically increased their income. I found a full-time job, which dramatically increased our income. The big difference were that they had fewer fixed expenses so a larger proportion of their income was able to be put toward debt. We do pretty well in our house, too, but Stephanie’s family has us far beat both on groceries (one of our big expenses) and on rent/utilities (they live for free in their in-laws’ basement for now). We’re different people. Different situations. But the desire to make comparisons is strong. I knew they would finish their debt journey before us. When Stephanie started blogging they were already down $40k, starting right at $100k in debt. And we didn’t even start our debt journey until a full 6 months after them. So obviously we would finish after them! We had different start points; it’s only natural we’d have different end-points. Even so, I felt jealous. Ohhhhh how I yearn to know what it’s like to be fully debt-free! To not owe anything to anyone. So I try to remind myself about all the AMAZING things we have already accomplished! Our only remaining debt is for student loans and medical debt. That means we own ALL of our possessions 100% outright (ahem – at least until we close on the house). NO ONE can come and take ANYTHING from us as a repossession or as collateral on an existing loan. Electronics, furniture, even vehicles = all are OURS!!! And we’ve paid SO MUCH DEBT off already! Yes, we still have a long way to go. But I’m proud of where we’ve come from! For newer readers, you might have a hard time believing that when I first started blogging here, many didn’t think I’d make it. There were whole GOMI threads dedicated to the Blogging Away Debt bloggers (Yes, I know about them. No, I don’t visit them often. And we’re rarely discussed anymore for that matter). People thought I was an airhead. Naive, dumb, blonde – whatever you want to call it. I was a different person then than I am now. A lot has transpired in the past almost 3 years! I still have my “airhead” moments. I am human, after all. But I’m learning. I got my first job! I have been working hard at negotiations (for title, raise, etc.)! I’ve learned about buying (and selling) homes! I’ve been working on the ever-elusive work-life balance. And even as we’ve increased our spending on “life” stuff (e.g., date nights, family entertainment, foods-not-cooked-from-scratch), we’ve still continued to put a good proportion of our income toward debt each month. In a typical month, about 25% of our take-home pay goes straight to debt. That’s in addition to our savings goals, our monthly expenses, etc. I’m proud of that figure. Recently I received a comment on an old post. Someone asked why I was still saving for retirement, contributing to my kids’ college accounts, and saving for an emergency fund all while trying to get out of debt. Dave Ramsey talks about how when you split priorities, you never get anything done. That’s why he’s all about focusing on one thing at a time. I wish I could. I wish we could be that focused. Most of Ramsey’s followers get out of debt in under 2 years. I believe their average is 18 months. We’re (nearly) 3 years deep, with perhaps another 2-3 years to go. That’s too long to put off life and living, in my opinion. We didn’t start out with only $45,000 in debt. We had $145,000 to contend with. And a lot transpires in the 5-6 years it will take us to be fully debt-free. Too much to go without for so long. As an anecdote – I remember asking my mom for foaming hand-soaps from Bath & Body Works for my birthday one year. I distinctly remember nearly tearing up about it. I felt so deprived that I would never be able to buy a stupid $5 soap because we were using the cheap bulk soap from Costco and refilling our hand soap pumps. How I longed for those Bath & Body Works soaps. Would I ever get to have fancy soaps ever again? Surely not! We couldn’t justify a $5 soap in our tight budget!!! I couldn’t live like that for a half decade or more. Some are stronger than me. Some may be less materialistic. Some maybe just don’t care a single iotta about their soap. And, to be fair, I still refill our hand soaps with the cheap bulk stuff from Costco. But this is just a silly example to discuss the idea of “living” while in debt-repayment. We were BARE BONES for a solid 2 years. I’m talking not a single new article of clothing, not a single professional hair cut or color, not a single vacation, all homemade foods/all the time, all from scratch/all the time, etc. I made my own baby wipes, for goodness sake! And I just couldn’t do it forever. At the end of the 2 year mark we made a conscious decision to loosen up the purse strings a bit. For us to make it through to the end of our journey, we just had to allow some room for “living.” Now we have monthly date nights (and we pay a babysitter to watch the girls! ), we went on our first real vacation (cruise 2016) this past April, I’ve bought new clothes – mostly for work, but when I need a new pair of jeans I just buy them instead of continuing to mend and re-mend the hole-in-the-crotch of the pair I already own (true story – I mended the same hole 3 times when I first started debt repayment. I refused to buy anything new and was determined to “make do”). The point is that we had to find what worked for us so that we can make it to our own finish line. How that looks will be different for every family. But maybe your family needs a little bit more room in the budget for discretionary spending. Maybe that’s what you need in order to survive the long haul to debt-freedom. I don’t regret the beginning of our debt journey. I think the first two years of super-strict spending gave us the jump-start we needed and put us in the right frame of mind to succeed. But there came a time when we also needed to be realistic with ourselves about our own limitations. We couldn’t keep at it forever at that pace. Rather than fall off the wagon entirely, we made the conscious decision to loosen up the budget a little. It can be a slippery slope and it’s not the right choice for everyone. But it was the right choice for us. And we’re still making killer progress, thank you very much (latest debt update here). So maybe this is a “do what I say, not what I do” moment. When you feel yourself becoming envious over someone’s debt journey, remember that it’s just that – someone else. It’s not you. It doesn’t reflect on you one way or another. It’s a different person with a different situation under different circumstances. What might work for them may not work for you and vice versa. Be kind to yourself, forgive yourself, and never give up. My debt-free date may not be right around the corner….but it will be here before we know it! Until then, I’ll keep you in the loop about our latest adventures on the journey.